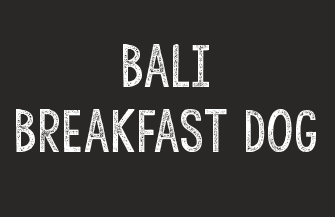 Inspired by our travels to Bali, this Breakfast Dog is truly special, in fact it has been crowned a ‘favourite’ by our testing panel already and it hasn’t even made the main stream menu yet! We are so excited to bring you the Bali Breakfast Dog, a fresh, zingy and satisfying mini Not Dog, designed to put a little sunshine in your step and set you up for the day! Celebrating the amazing avocado, with of course a very subtle kick of mild chilli (for Kickin’ Katie) the Bali Breakfast Dog will be available all day in the Not Dogs restaurant – coming soon!